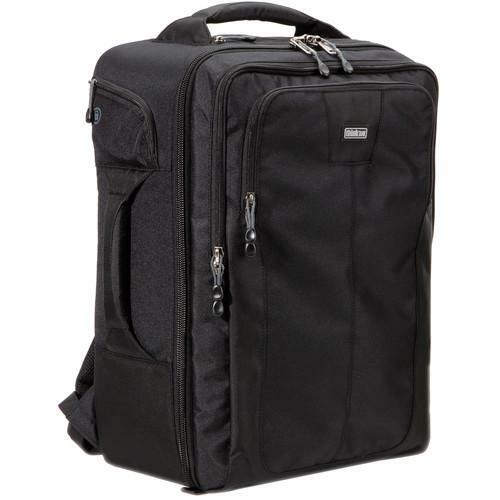 We recommend checking out our discussion threads on the Think Tank Photo Airport Accelerator Backpack (Black) 489, which address similar problems with connecting and setting up Backpacks & Sling Bags Think Tank Photo. The user manual for the Think Tank Photo Airport Accelerator Backpack (Black) 489 provides necessary instructions for the proper use of the product Photography - Bags & Cases - Backpacks & Sling Bags. The black Airport Accelerator Backpack from Think Tank is an immense pack designed for the serious pro that needs to carry an entire camera system. This huge pack will accommodate two pro DSLRs as well as 6-8 additional basic zooms including your 500mm f/4 attached to a body or an unattached 600mm f/4 without hood. Larger than Think Tank's Airport Commuter, this pack contains the same features but on a larger scale. Your 17" laptop and iPad are held in their own separate, zipper lockable compartment. If you own a Think Tank Photo backpacks & sling bags and have a user manual in electronic form, you can upload it to this website using the link on the right side of the screen. Material Exterior: Treated with DWR (Durable Water Repellent) while fabric underside is coated with PU (polyurethane) for superior water resistance, YKK RC Fuse (abrasion-resistant) zippers, 1680D ballistic nylon bottom panel, 600D polyester, 420D velocity nylon, 3D air mesh, ultra stretch pockets, Y-buckles, antique nickel plated metal hardware, big hole air mesh, honeycomb mono mesh, nylon webbing, 3-ply bonded nylon thread. Please note that exterior dimensions do not include the added thickness of the harness or handles. Box Dimensions (LxWxH) 21.0 x 15.0 x 11.0"
The user manual for the Think Tank Photo Airport Accelerator Backpack (Black) 489 can be downloaded in .pdf format if it did not come with your new backpacks & sling bags, although the seller is required to supply one. It is also quite common that customers throw out the user manual with the box, or put the CD away somewhere and then can’t find it. That’s why we and other Think Tank Photo users keep a unique electronic library for Think Tank Photo backpacks & sling bagss, where you can use our link to download the user manual for the Think Tank Photo Airport Accelerator Backpack (Black) 489. The user manual lists all of the functions of the Think Tank Photo Airport Accelerator Backpack (Black) 489, all the basic and advanced features and tells you how to use the backpacks & sling bags. The manual also provides troubleshooting for common problems. Even greater detail is provided by the service manual, which is not typically shipped with the product, but which can often be downloaded from Think Tank Photo service. If you want to help expand our database, you can upload a link to this website to download a user manual or service manual, ideally in .pdf format. These pages are created by you – users of the Think Tank Photo Airport Accelerator Backpack (Black) 489. User manuals are also available on the Think Tank Photo website under Photography - Bags & Cases - Backpacks & Sling Bags.